This week, our guest blogger Georgie Moon shares her experiences about sailing in Skyros, a rather unknown, yet wonderful island in the Sporades. Georgie is an experienced sailor who has contributed several guides and stories about sailing in Greece to the Zizoo magazine. 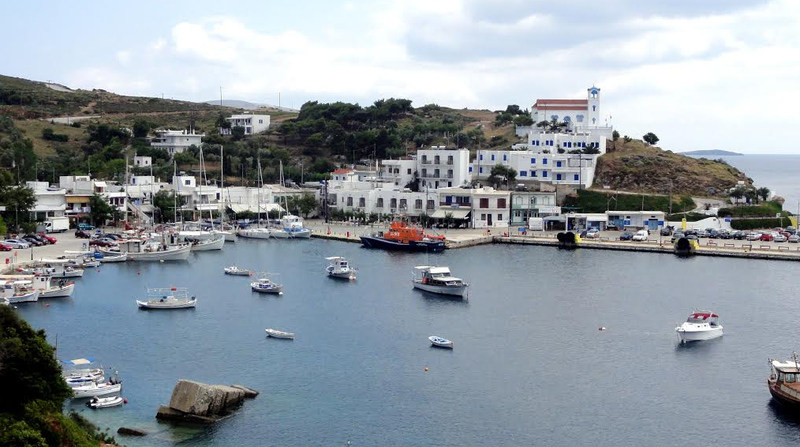 Read on to learn more about sailing in Skyros and why this island is so special. The island of Skyros is often regarded as the ‘odd one out’ of the Sporades group. Although it is the largest of the group, Skyros is somewhat remote and therefore off the main tourist trail. There are no ferry links to the other Sporades islands and the only ferry is between Linaria, the main port on Skyros, and Kimi, on the island of Evia, its nearest neighbour. To make up for the lack of inter-island transport, the arrival of the ferry ‘Achileas‘ at Linaria in the late afternoon is announced by loudspeakers in the port booming out the music of Richard Strauss’ ‘Also Sprach Zarathustra’ at full volume. We had read about this before we arrived, but to actually witness it is a surreal experience! If you pick up a charter boat from Skiathos, it is almost 50 nautical miles in a south-east direction to Skyros, and even if you leave from Alonissos, it is still a 30 mile sail. These distances may make a visit to Skyros by yacht difficult, especially if the weather is unfavourable. However, if you do make the effort, you certainly won’t be disappointed. Having arrived by yacht in a great many locations in Greece, we have been used to choosing our own berth on arrival, mooring independently, and finding out about the local facilities ourselves. Linaria on Skyros was one of the few places we visited which was not typical of Greek harbours. We were welcomed by the most helpful harbourmaster, who allocated us a berth favourable for the breezy weather conditions, and helped with our mooring lines. Being the only port on Skyros, Linaria is situated in a large bay on the west coast of the island. Facing the prevailing winds, it is not perfect shelter but is certainly tenable. It is also possible to drop anchor at the top of creek if it is blowing strongly. After politely introducing himself in perfect English, the harbour master explained where we could find water, where the shops were, and provided lots of other useful information. The next day we hired a car and enjoyed a tour of the island, and were lucky enough to see many of the famous Skyros ponies, a very rare breed, native to the island. There are only around 300 of these ponies left in the world, and almost 200 are found on Skyros. Many are looked after by volunteers on a farm, which welcomes visitors. Another highlight of our trip around Skyros was the drive to the chora, or hill town. This picturesque town of traditional white-washed houses, is full of winding streets, with magnificent views over the countryside, and the beaches below. There is a Byzantine castle at the highest point, guarding everything below it. There is a museum within the castle, and a monastery nearby. It was easy to spend a whole afternoon in the town, looking at the tiny houses with coloured doors, and exploring the narrow alleys full of tiny shops selling traditional goods. The taverna we chose for our meal, welcomed us with a drink of traditional ouzo before showing us round their little kitchens where beautiful Greek dishes were prepared. In the evening, as the sun was setting, we were treated to some stunning views over the Aegean Sea.